Sunscreen is an important part of every skin care regimen, but not all brands are good for your skin. Colorescience fragrance-free sunscreen is made with natural ingredients designed to protect your skin from the sun without any side effects. Keep your skin safe and protected with our line of Sunforgettable mineral sunscreen. What dangerous ingredients are in sunscreen? Some sunscreen ingredients are known to cause irritation, discoloration, and allergic reactions. Parabens are a classic sunscreen ingredient responsible for inflammation. Parabens are used as a preservative in many cosmetic products to prevent bacteria growth. This chemical can cause adverse side-effects, including hormone disruption, protein breakdown, degeneration of cells, and premature aging. Avoid these toxins by using a paraben free mineral sunscreen powder from Colorescience. Oxybenzone is another active ingredient found in most sunscreens. Despite its protective quality, Oxybenzone has been shown to penetrate the skin, causing photo-sensitivity and an increase in harmful free radicals. Use a Colorescience sunscreen powder without Oxybenzone to preserve youthful-looking skin while protecting it from UV rays. Is Colorescience sunscreen safe for my skin? Yes! Colorescience offers all natural mineral sunscreen as a simple sun-care solution. Our chemical free sunscreen offers broad spectrum UV protection without any harmful ingredients. Whether you opt for our non-toxic sunscreen with SPF 50 or elect for safe sunscreen with SPF 30, you have plenty of options to pick from. 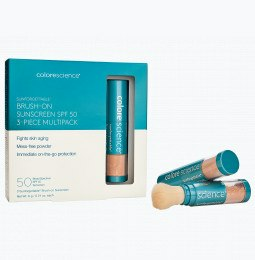 How do I apply Colorescience fragrance-free sunscreen? 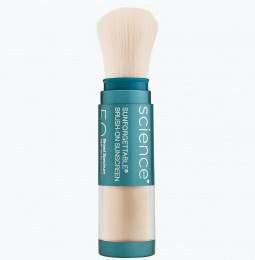 Our Sunforgettable Brush-on Sunscreen provides protection in one easy, on-the-go application brush. You can wear our fragrance free sunscreen by itself or with makeup. Simply sweep the brush over the face and body to release powder for sheer, natural-looking coverage, or use small circular strokes for more coverage. Apply Colorescience’s organic brush-on sunscreen liberally and evenly before sun exposure for best results.